Singer, songwriter, pianist, Alice Evans' inaugural self-titled release, Alice Evans, is a pop music Indie release with arrangements that accentuate Alice's powerful lyrics, which are a blend of poetry and stories. The release is twelve original tracks that take the listener on a journey into the emotions of hope, passion, and trust as felt from love lost and love found. 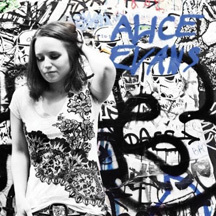 Alice Evans is a pop music Indie release produced by Maximillian Keene and Alice Evans. This marks the first, in what will be a long line of releases, from the talented, singer, songwriter, and pianist Alice Evans. Born in the Pacific North West in Seattle, she absorbed the many variations and powerful flavors of music from that area, and she learned the unique art of creating arrangements that complement her expressive lyrics. I literally bumped into Alice Evans at the New York Culinary Experience, where she was honing her cooking talents during the 2-day weekend classes held at the International Culinary Center in New York. While sampling some outstanding appetizers and wines, I learned that Alice was a musician, so I asked if she could send me a copy of her release. Alice, being a proactive musician and marketer, had brought copies with her and generously provided me with one. What drew me to Alice's music was not just her engaging lyrics, but how she uses her arrangements to accent each and every emotion she is expressing; this is readily felt from the first track, Canyon River, which has an opening piano segment that is simple in chords but it draws the listener into the music and envelops her lyrics, "Canyon River, pull me away ...What pulls me down, pulls me up again." The track Never Have Lived speaks to the feeling of starting out on your own, and when times get challenging, and even though you have tried to move on, it seems that you never have lived, "Starting a path, they say, takes you right back home." Now or Never is a poignant track that uses the cello to echo the sound of a human voice that rings as background vocals while Alice shows her vocal prowess and culls the listener with her touching lyrics, "You're a beautiful rose, you just have scars." The Tango is a fun track with a tango melody and fanciful lyrics that tell a story of love and hope for a relationship that will not happen. Alice opens up the tempo with the track No Apology Owed, and through her sultry voice and wonderful piano work, she paints a picture of passion that no matter what the circumstance, she will always be there. Other tracks include, J Man, A Long Time Ago, Open Up Your Eyes, Turn out like you, Sweet Angel You, She Won't Come Back, and the last track, We Are So Afraid (to love), a beautiful and tender arrangement that fittingly closes her impressive and commanding release with the poetic lyrics "We are so afraid to love, It's the only thing that's really tough." Websites where you can procure Alice Evans are Amazon, CD Baby, and iTunes.